They say books can change a life. I know that that’s true. Looking at the letter H for the challenge, I had three or four options. But only one of those had really changed my life. That’s why the Harry Potter series gets the spotlight yet again on this blog. I have read the series so often that I even did an AtoZ on the series in 2016 and was thinking about a second round on it this year. The Harry Potter series has seven books that fall into the fantasy genre. 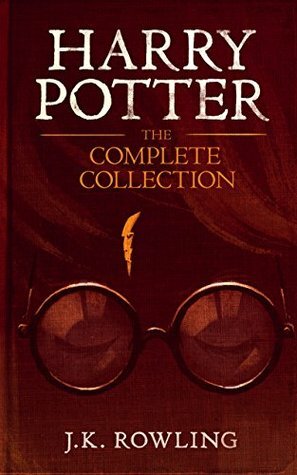 It is the story of Harry Potter, a wizard, who has grown up in the guardianship of his Aunt Petunia and Uncle Vernon, along with their son Dudley. On his eleventh birthday, Harry discovers his magical heritage and goes with the half-giant Hagrid to the Hogwarts School of Witchcraft and Wizardry. The series focuses on his friendship with Hermione Granger and Ron Weasley, as well as his past, present and future with nemesis Lord Voldemort, a dark wizard who wants to take control of the magical world. The Dark Lord though is without his powers in the first four of the books, having lost it while trying to kill Harry when he was a baby. Each book covers one year at wizarding school, and brings a different adventure. I discovered the series through my school library. I found the third book The Prisoner of Azkaban first and read that, then read the whole series in chronological order. If you ask me now what attracted me to the books, I wouldn’t know. Maybe it was the school setting, or the characters. It might even have been a temptation to fall in with classmates who were raving about it. But once I got started, I couldn’t stop. For Harry, who lost his family when Voldemort murdered them, and who hasn’t really known love with his guardians the Dursleys, the magical world became his family. The book has many characters I love, like Molly Weasley, Lupin, Hedwig and Dobby. It has truly despisable villains like Umbridge and Bellatrix. I’m not focusing on the main characters, but the supporting cast. There are spells that are meaningful, that make sense when I look at it from a personal perspective as well. There are potions like Felix Felicis and the Polyjuice Potion which are interesting. I could understand something deeper in those too. I loved the game of Quidditch, especially in the third and fourth books. And not to mention Honeydukes and the sweets there. I’ve often imagined myself walking down the lanes of Diagon Alley, awestruck and window shopping at the various shops. I’ve been to Hogsmeade and drank Butterbeer at The Three Broomsticks. I’ve felt the chill as a dementor has come nearby. And I’ve definitely imagined having some Galleons, Sickles and Knuts in a vault at Gringotts. Just one thing you might like to correct – Harry’s uncle was Vernon, not Quentin. Made the correction, I was very tired while writing the post, but still surprised that I made the error! I highly regard Harry Potter. You reminded me of the gillyweed Harry learns to help him “win” the competition in the second task of the Triwizard tournament. Did he come in second? I forget. Also, I love the Fantastic Beast and Crimes of Grindelwald movies which Herald Harry Potter. I think he came in last in the second task but was awarded the most points, Jackie 🙂 I like the Fantastic Beasts movies too. When it comes to HP, I don’t think there’s a time limit to the party. 🙂 Thank you, Debbie. I discovered Harry Potter when I was in my mid thirties. Imagine! All the craze around it when it first released sort of put me off but once I started it, I craved for more everytime. That’s beautiful, and further validates my belief that there’s no age to start reading the books 🙂 Thank you for dropping by, Varsh.